The low-FODMAP diet has been shown to be an effective dietary treatment for irritable bowel syndrome (IBS) for the large majority of people who give the diet a try. Typically, best results are achieved when you attempt the diet under the supervision of a qualified dietary professional. 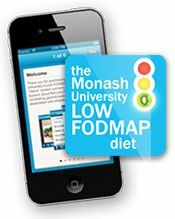 Since your dietitian or health coach will not be by your side at all times, you will quickly find that the Monash University Low FODMAP Diet App becomes your absolutely essential go-to resource. The app was published and is maintained by researchers at Monash University in Australia, the place where the diet was originally formulated. The app is constantly being updated as new foods are tested for their FODMAP content. Thus, you can trust that this app is not only giving you scientifically based information about any foods you are considering eating, but also that you are getting the most up-to-date, comprehensive information that is out there. Luckily, the app is available for both Android and Apple devices. Although the app offers a ton of value for your investment, by far the most helpful feature is the comprehensive food guide. The database is easily searchable by specific food or category. The specific food search option is helpful, of course, if you want to quickly find out about the FODMAP content of a particular food, while the category option is extremely if you are faced with a variety of food choices (such as in a store or while looking at a menu) and want to know which food would be your optimal choice. What makes this app so user-friendly is that it uses a red, yellow, or green circle rating system. At a glance you can see if a food is low in FODMAPs (green) or high in FODMAPs (red). Foods that get a yellow rating are those that are low in FODMAPs at smaller portion sizes. The food database goes beyond individual food items as the University has been testing pre-packaged foods from a variety of countries. 1. You will find a comprehensive selection of articles covering all aspects of the diet, many of which offer highly specific tips for ensuring that you are following a healthy, nutritious food plan. 2. You will find a variety of low-FODMAP recipes, with options for snacks as well as all your main meals. 3. You can create your weekly shopping list right within the app, armed with confidence that you are only purchasing low-FODMAP foods. 4. You can use the app to record what you eat and how you feel in a nifty little Food & Symptom diary. The app will then create summaries and graphs for you to show to your doctor or dietitian. The low-FODMAP diet may be an effective one, but it is certainly not easy. This app goes a long way toward making the diet do-able. Its quick, easy, and visual food rating system provides you immediate information regarding what foods you should and should not be eating. The other app features are just icing on a low-FODMAP cake. This app is definitely a must-have for anyone who is on the diet. Even if you are not in a position to commit yourself to the low-FODMAP diet at this time, the app can be quite helpful. Figuring out what to eat for IBS can be quite a challenge. The low-FODMAP researchers have taken a lot of guesswork out of the equation for you. You can use the information on the app to make food choices when you are in an IBS flare, when you have an important event coming up and you really, really want to be symptom-free or any other time when your IBS may act up (e.g. travel or during times of your menstrual cycle.) Just remember that the low-FODMAP diet is not intended to be a long-term diet as there are many health benefits to many foods that are high in FODMAPs. The diet (and the app!) are designed to be used as a tool to gain information as to which foods are triggers for you and to use that information to eat the widest variety of foods that you can without experiencing excessive digestive symptoms. The app is available through the iTunes Store and the Google Marketplace.